Mid-winter in Alder Lake Park, a photo by The Bacher Family on Flickr. 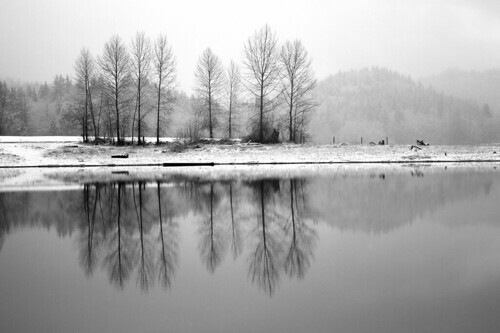 There's little more austere than a stretch of alder trees in the middle of winter... unless it's that same scene doubled by its reflection in the still water of Alder Lake. This is Alder Lake Park, in fact, a small picnic area and wading beach in the summer time but abandoned to the elements in mid-winter. Still, there's a stark and quiet beauty to the scene as the snow drifts across the surface of the lake, barely enough to ripple its surface but just enough to make the distant peaks fade a bit into the fog.